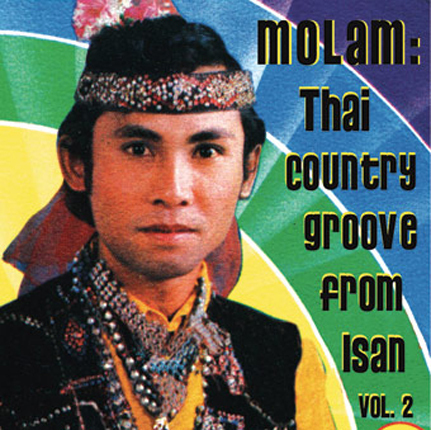 MOLAM is a multi-faceted folk country music native to Laos and the collection of rural Northeastern Thai provinces called Isan. "Molam” is an umbrella term used for numerous Lam styles. It literally translates into "expert singer" or "expert song". Featured here in volume 2 of this series are Lam Phun, Lam Thuy, Lam Plern, Lam Dern and Lam Sing styles of Molam recordings from the 1970s and 1980s. All of these forms are built from a tradition that is centuries-old. A few examples of Molam/Luk Thung (Thailand’s national country music) hybrids are also featured here. In the late-1960s, at the onset of Molam's modern genesis, electric guitars and organs were introduced alongside the extant folk sounds of the khaen (bamboo mouth-organ) and Phin (Thai lute). Hybrid styles were formed with an electrified sound that jived with tradition while creating something entirely new. Much of the music relies on stock formulas, designed primarily to showcase the stylings of various singers from the region. But, as this brilliant collection demonstrates, the rules tend to bend a bit as more adventurous groups experiment with the genre and the production. Sound effects, flamboyant vamping, odd vocal styles or trick intros and finales based on popular rock themes show up now and then, among other playful and dynamical shifts, making for some exceptional listening. So join us now in our perpetual and confounding love affair with Thai Isan Molam. Enjoy this rarely heard music, culled from vintage cassette and vinyl recordings, rescued from the silent places in which they've rested for the past decades.